In a nature film, which showed an Indian tribe living in a jungle in the twenty-first century, the narrator noted with regret that the death rate of those without access to a doctor is almost fifty percent. After a while he pointed out that half of them die of natural causes before having children. Susan Scott's research shows that at the end of the sixteenth century, [...] the average family usually had about four children, of whom only two lived to an average age of 15 years ["Black Death. Epidemics in Europe from antiquity to modern times. ", Page 13]. My grandmother, born in the late nineteenth century, told me the same: "We were ait siblings togethere, but sadlee for off us dide yunge". Four of the eight is fifty percent! In my grandfather's family the situation was similar. And into the next generation - this time from my mother - not all her siblings lived to a reproductive age. Only one sister of five died, but it was a more contemporary time. There is, therefore, a natural threshold for mortality of the species Homo sapiens sapiens. On the basis of Susan Scott's research, the stories my relatives told and the observations from the film, it can be assumed that, in the absence of medical care from the sixteenth to the twentieth century, the death rate amongst the young stood at about fifty percent. A higher death rate equates to a stronger selection process and lower to a weaker one. The precision in determining this percentage is not important, it is sufficient to say that each species has its own natural pre-reproductional mortality at the perceived level of s percent. The term "natural" means that the living objects themselves are dying and that they are not killed by extraneous variables. They simply die of so-called health reasons - s subjects out of a hundred die before they reach reproductive age. This shows that their designs are so bad that they are unable to cope with their external conditions. Of course, as a consequence, they do not undergo further processing steps in the biological evolution process (based on gerpedelution). Those designs that are allowed to undergo further steps of the process of evolutionary improvement are those from which sufficiently healthy individuals are built. "Health" should be understood as an appropriate set of properties and the appropriate states of their values together to ensure living objects live long enough to make procreation possible (so-named fitness). On the basis of such designs, the next generation will be created. And the s-natural mortality rate will be observed in this generation. Can you draw a conclusion from this? This observation is a kind of fingerprint, from which we, as detectives, try to determine the nature of the design modifying function (or designs in the case of sexual reproduction). Let's have a look at the picture "Stabilizing 'S per hundred'." Stabilizing 'S per hundred' diagram. The bell-shaped111 curve shows the distribution of the properties of a selected population of parents. As an example, we have considered the volume of the brain (the given volume of the brain is one particular state of the property "volume of brain") or the level of the immune system (e.g. the state of the properties commonly known as health). The black area indicates the proportion of the population who die of natural causes before giving birth, while individuals from the green area manage to reproduce. It turns out that, as a result of the action performed by the modifying function on a set of good designs (designs from the green area), in the subsequent generation s per cent designs are unsuitable again. So the designs modifying function transforms a collection of good designs into the new set, in which the proportion of bad designs is still at the level of s% . This phenomenon has already been observed by Darwin, who wrote in "The Origin of Species ..." about the natural tendency of reversion to a less perfect state. 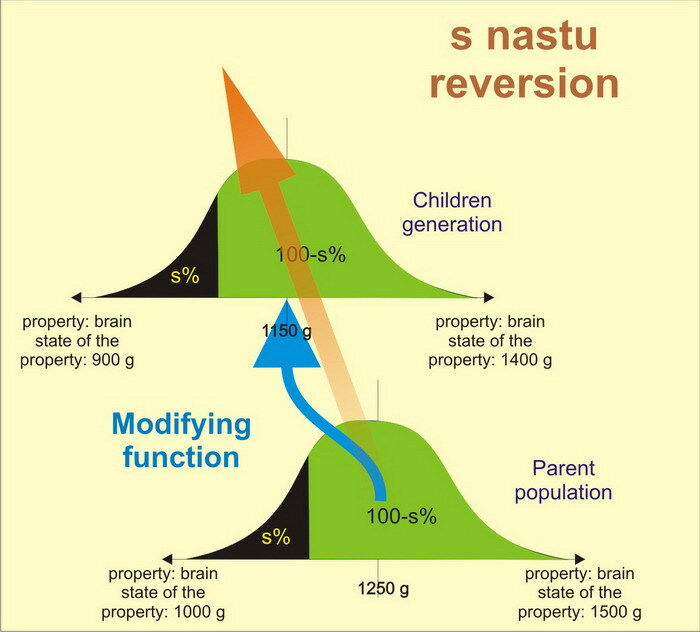 when a population is submitted to a weak selection function, it results in the degeneration of genetic and/or memetic designs in subsequent generations. Eventually, it will lead to the extinction of this population. accumulated over tens of millions of years and found an interesting pattern. In North America, "the relative size of the brain" of carnivorous mammals - brain size to body size - has a strong tendency to increase over time. The same applied to the brain size of herbivorous mammals that were their prey. At the same time, a comparable herbivore from South America, which was not threatened by predators, did not show significant changes in relative brain size. Therefore, the constant challenges for resources favours the development of the species. [Nonzero: The Logic of Human Destiny, Robert Wright]. Therefore, the strong selection function favours the development of the species. On the basis of fossils of our prevoluants, it was found that the increase in brain size from Australopithecus africanus to Homo habilis to Homo erectus to early Homo sapiens to modern Homo sapiens was a dynamic process, with no signs of reversion [Nonzero: The Logic of Human Destiny, Robert Wright, p 306]. Three million years and almost a threefold increase in volume. Three million years of continuous expansion of the brain, until the turning point, about fifty thousand years ago, when Homo sapiens brain began to shrink! The exact same process is observed in livestock. This is probably when man started to live an easier life. Because of our homes and our "beloved" governments, no animal treats us as lunch. Fossil studies have established that during this period man began to use sophisticated hunting strategies, used clothing, built new, more perfect, habitats and made great technological leaps forvard in the development of tools. At about this time art appeared, which were the first forms of decoration and ornamentation. 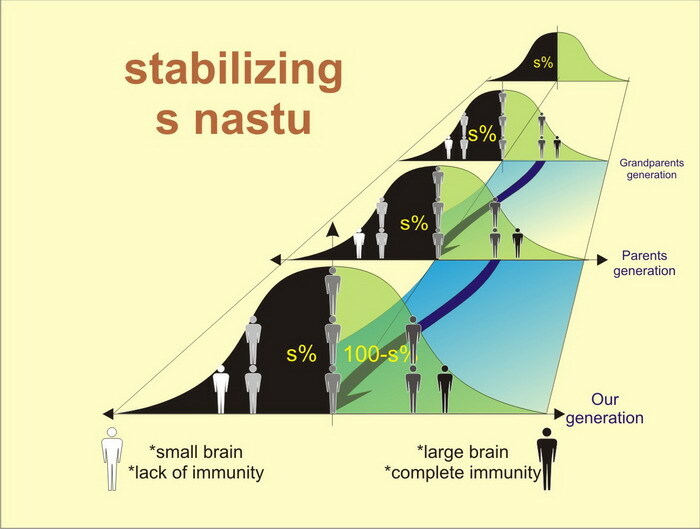 If the S-nastu hypothesis is proven, it seems that the extinction of our species is inevitable. It's not because we will lose the fight against viruses, bacteria and fungi, which we are winning at the moment, but because we will lose our efficiency - to move and to think creatively! As far as moving is concerned, chimpanzees - our prevoluants - are far ahead of us. "Why is movement so important, after all we think and this is our main strength" - someone will say. Unfortunately, in the light of our hypothesis, some futurists envision superbrains on wheels, which are impossible - the brain of our species in the absence of strong natural selection has a natural tendency of reversion to a less perfect state. Maybe identifying intelligence on the basis of modern examinations or understanding of derivative calculus is wrong? Maybe our ancestors from fifty thousand years ago were smarter than us, smarter on average by the fifteen percent we have lost in our brain size. Our ancestors did not learn of the world - they discovered it. Discoveries require much greater intellectual effort than learning about them. We should emphasize that our ancestors had no theoretical background at all. By looking at our prevoluants, and a handful of primitive tribes living today, in this way, they should be assessed as exceeding us in terms of intelligence. The scale of their achievements is best shown by the fact that it is they who laid the foundation for the ideas of learning and acquiring new skills. 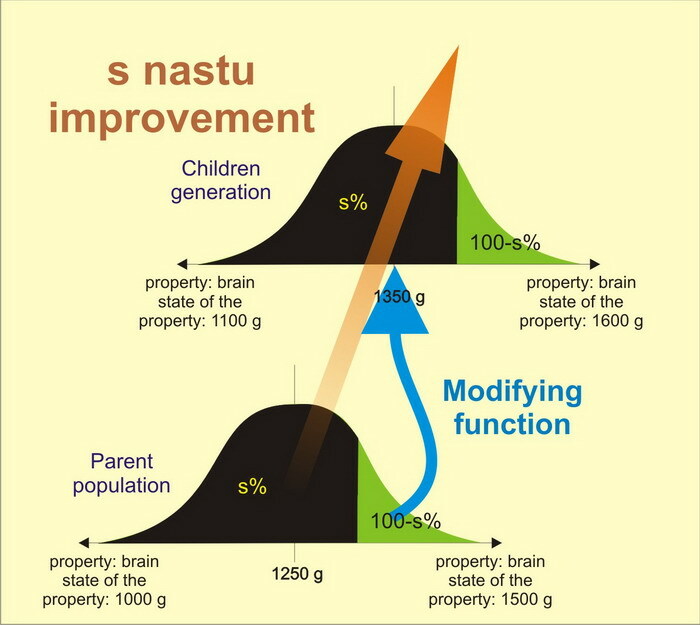 either we are submitted to a strong natural selection (see s-nastu improvement graph) and we survive as a species or we live as we are (see s-nastu reversion graph) and we will gradually die out. So we have a very vital game theory dilemma. Let's name it s-nastu dilemma. The achievements of civilization which increase our comfort and safety contribute that the weak and frail individuals multiply. Rather than naturally becoming extinct, they breed at the same rate as the strong individuals, making the set of genes of the human race increasingly weaker. The main "criminal" against humanity is, paradoxically, medicine. Thanks to the growing number of weak, sick or not too smart people, who "normally" do not reach reproductive age, now multiplying exponentially, transferring and distributing their own weaknesses to subsequent generations [anonymous surfer ~ alpha, 2008.12.08]. If this continues, our genetic designs will degrade to the point that we will not even be able to - without drugs, prosthetics and computers - support our existence. According to ~alpha - the only solution will be the introduction of gene selection and the implementation of the right to reproduce only for people with genetic designs of quality "above average". I am sceptical of this, as the most important factor in biological evolution are the words "natural selection" and not artificial selection as stated. The reason of this sceptisism is the fact that humans, no matter how wise they are, cannot naturally select! 111 This curve may not be as regular as shown in the diagrams. In fact, it may look different, but because we do not know the exact shape of it, we have used a standard bell-shaped curve as a model. 112 The name "S-nastu" comes from the Polish equivalent of "s na stu" - "s per cent" - "s in a hundred." Were the Victorians cleverer than us? Research indicates a decline in brainpower and reflex speed thanks to 'REVERSE' natural selection.